With the GENO•CARD DNA can be extracted as quickly as possible. For this, a drop of the sample material is applied to the GENO•CARD. Using a special punch as well as the appropriate punch support, a small stamped piece is taken from the sample applied. This stamped piece is used directly in the amplification reaction. 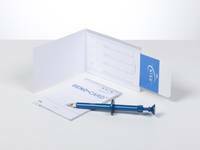 With the GENO•CARD you thus have the possibility to extract DNA for PCR from blood or a positive blood culture in only a few steps. The GENO•CARD represents enormous time savings as compared to conventional DNA isolation methods. Easy-to-use: simple to perform with few work steps, thus allowing DNA extraction within only a few minutes. Once the sample material has been applied, it can be stored for months. Time-saving: rapid DNA extraction shortens total test time and therefore makes your laboratory routines even more efficient. Cost-efficient: no cost-intensive instrumentation is needed to perform rapid testing.